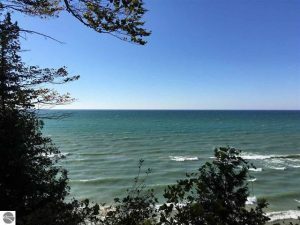 Dazzling Lake Michigan view from this three-season, three-bedroom, small cottage tucked into 6+ acres on a wooded high bluff, just south of Arcadia’s Scenic Overlook along M-22. Vacationers are drawn to the hidden but convenient location, with all the right inspiration for an artist’s or writer’s retreat. Intrepid dune climbers can descend to the cottage’s private, sandy frontage on Lake Michigan — 700+ feet of your own beach to enjoy. Cottage features a charming “retro” interior, with small bedrooms, living room with natural fireplace and a big picture window, kitchen with Formica counters and iconic stove, and a partial basement for your laundry and storage. A low profile plus built-in cabinetry lend this cottage a mini Frank Lloyd Wright feel. If it’s all too nostalgic and Hobbit-like for you, then renovate or build anew.